Arden Griffins remain the only team who can stop Tile Hill Trojans from winning their sixth title in eight years and took no chances when they tore Leamington Spartans apart at St. Peter’s. 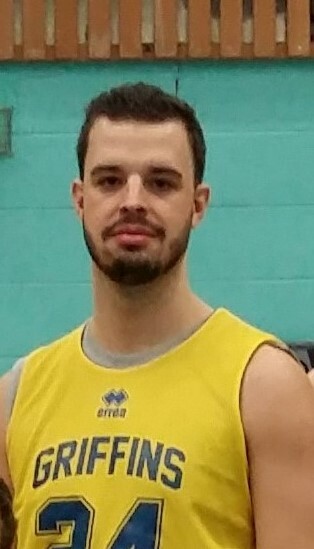 Griffins’ captain Jack Forrest (pictured) said “We slipped up by underestimating them in the Handicap cup and as a result we went out of the competition so this time we were sure we would not make the same mistake again.” And this is exactly how it worked out as Griffins were immense in offensive play whilst being intense at the other end, restricting Spartans to just 27 points in a game which saw leading three-point scorer Paul Roberts adding another six to his already superb total for the season. Roberts is now heading for an unprecedented hundred triples and seems to rise from nowhere to land his shots with apparent ease. Arden powered to the front and led 22-7 after the initial quarter with five already in the bank from outside the arc, and when they added another four after the restart, the record books looked to be in danger. But things quietened down as the game wore on, griffins going on to win 88-27 with Roberts and fellow hot-shot Luke Hatfield both on 18 points, behind Sam Workman’s 24. Trojans meanwhile gave Tamworth Tigers something to think about as the pair prepare to go head-to-head in the cup final in a week’s time. Admittedly things will be different then as Tigers will probably get a sizeable start but to give an indication as to the power in the Coventry side’s squad, they were without four regulars and still went home with a 90-57 win under their belts, led by Mark Larner and Ash Dickson who equally shared 38 points. Aylesford Hawks put their game against Ernesford Eagles to bed with a good second-half showing after Eagles had threatened to upset the applecart early on. The final quarter belonged almost exclusively to Ricky Fennell as he accounted for 21 of Hawks’ 28 points as they took complete control and coasted home, the Aylesford marksman hitting a match total of 39 points. Cracovia Stratford had to work hard before finally overcoming the challenge of JM Grizzlies as the Warwick side looked capable of pulling off a surprise away win. As things turned out, Stratford used their three-point shooting ability in the final quarter to surge from 49-48 to 62-50 and that was that. Rugby Rage are on the brink of a perfect season and they racked up yet another win in Division Two. This time their victims were Team Rebels who were taken down 78-50, and Rage are only three games away from achieving their aim for the season as promotion beckons. Rebels’ tale of woe continued when they played host to Westwood Rhinos and, in a very low-scoring match Rhinos won 36-29 and Nuneaton Predators almost grabbed a sensational win against Tile Hill Trojans 3 at Hereward College before the home side’s inside power took them through 60-58 with Trevor Robinson snatching 25 for Trojans and Zoheb Deen 23 for the unlucky visitors.